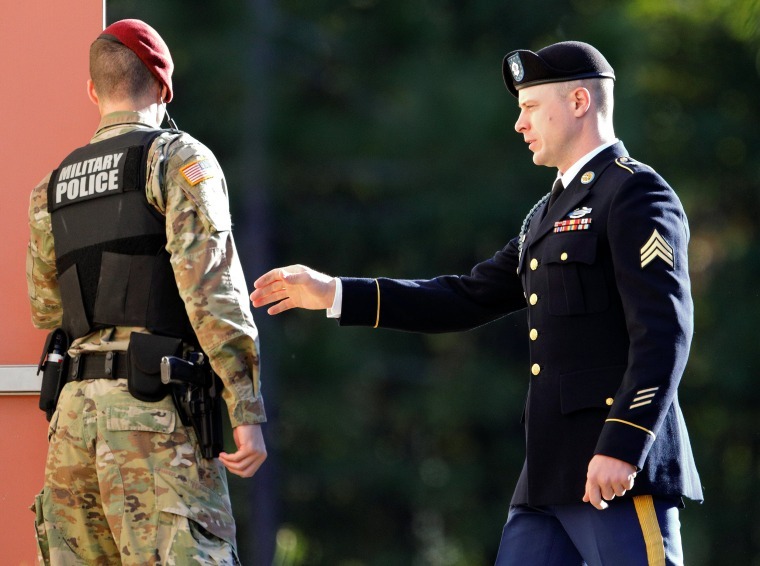 FORT BRAGG, N.C. — The military court judge who holds the fate of the accused Army deserter Sgt. Bowe Bergdahl in his hands allowed the soldier's sentencing hearing to resume on Wednesday despite not yet deciding whether to put the kibosh on the case. Col. Jeffrey R. Nance, who could send the 31-year-old Bergdahl to prison for life, said he was still weighing a motion by the soldier’s defense team to dismiss the charges. The defense contends Bergdahl can’t get a fair shake from a military court because President Donald Trump recently doubled-down on disparaging comments he made about the soldier on the campaign trail. Among other things, Trump has called Bergdahl a “dirty rotten traitor” and called for him to be executed by firing squad or thrown from a plane without a parachute. Nance had previously described Trump’s remarks as “disturbing and disappointing” but said they did not rise to the level of “unlawful command influence” because he made them while he was running for office. As commander in chief, Trump is Nance's boss. And the judge told the court that he needs to consider whether Trump crossed the line, because there is a vital public interest in "maintaining confidence in the military justice system" and the public "is going to be influenced by context." Bergdahl has already pleaded guilty to desertion and misbehavior before the enemy. He claims he was trying to reach other Army commanders so he could blow the whistle on what he considered misconduct in his unit when he was captured by the Taliban. He said he didn’t mean to put any other soldiers in harm’s way. Prosecutors say Bergdahl is a deserter and his disappearance triggered several search-and-rescue missions during which some service members were injured. After Nance made his announcement, five service members who took part in the search for Bergdahl after he vanished from a post in a remote corner of Afghanistan on June 30, 2009, took the stand and described how they braved Taliban bullets and had to contend with high heat — and dysentery. “I let it go in my pants and carried it for 19 days,” Capt. John Billings, who was Bergdahl’s commanding officer, testified. Billings said when he first heard that Bergdahl was missing he thought it was a joke. He said they would go out on search missions that lasted for up to 20 days. He described the psychological toll that sleeping on mountains and going for days without much food or sleep took on the troops. James Hatch, now a retired Navy Seal, cried on the stand as he repeated an account he has given to several news organizations about how he and a military dog named Remco were shot by the Taliban on one of those rescue missions. Hatch said they came under fire by Taliban fighters with AK-47 rifles when their chopper landed near the Pakistan border to investigate a tip that Bergdahl was being held nearby. He said he was hit in the leg — an injury that resulted in 18 surgeries and ended his military career. He said Remco’s jaw was blown off and the dog later died. Col. Clinton Baker, who was Bergdahl's battalion commander, testified that "everybody was out looking for him." The other two service members who testified were Evan Buetow, who was a sergeant in Bergdahl's unit, and Col. John White, now retired. Bergdahl, who for five years was tortured and abused and forced to spend long stretches of time in solitary confinement, was released in 2014 in a prisoner swap for which President Barack Obama was roundly criticized by Trump and the Republicans. The hearing resumes at 9 a.m. ET Thursday. Prosecutors are expected to put at least two more witnesses on the stand. Shauna Williams reported from Fort Bragg, and Corky Siemaszko from New York City.